Internet plays an important role in today’s digital world that’s why more and more people are using internet day by day. From collecting information to promoting businesses, internet has become an essential medium in today’s competitive world. Looking at the numbers carefully, one will find that India has now placed on the third spot in the number of Internet users just behind China and USA. In past several years, there has been a significant rise in internet users in India. Having the vast population and stiff competition in the market, it is really a challenging task for internet service provider to offer faster speed and quality services round the clock. Keeping in mind the value of seamless broadband service, TriplePlay has strived to bring innovative technologies and latest methods to give users an ultimate experience of using internet. PM Modi launched the ‘Digital India’ program on July 1, 2015 with an aim to make India digitally empowered country. The program also aims to improve digital infrastructure and bring transparency in the governance. The main aim of Digital India is to help citizens and improving service delivery via e-governance. Making this program a success, TriplePlay broadband service plays a vital role in creating a strong bridge of connectivity between the rural and urban areas. 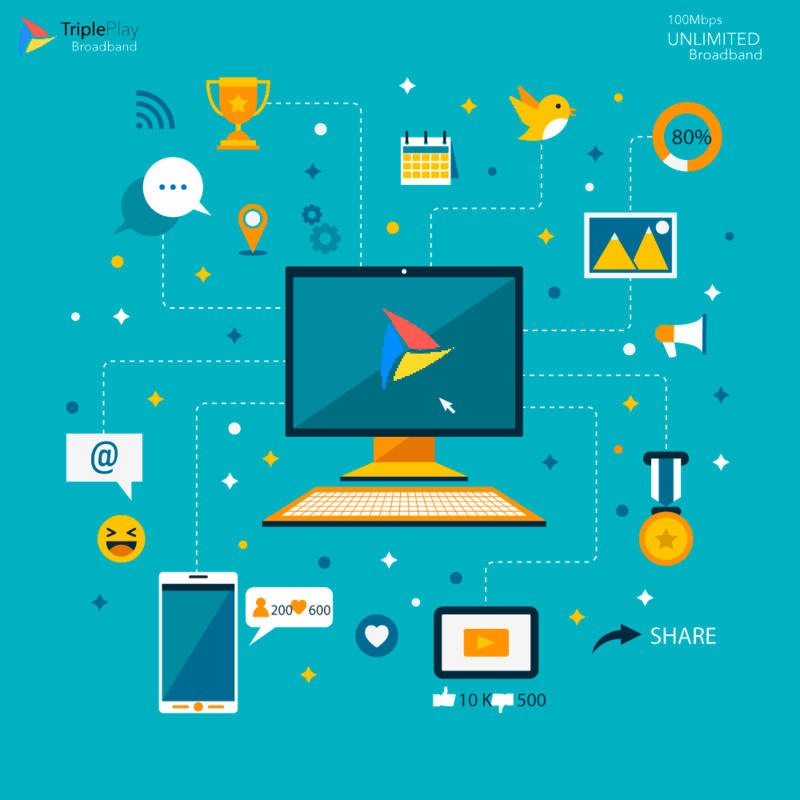 We at TriplePlay always work hard to provide smooth and high speed internet connection to the users with an aim to improve their social standards. With our outstanding services, we are helping to transform North India into a digital world giving a pleasurable experience to the users throughout the day. With a lot of hard work and strong dedication, today we have become a giant player in providing best-in class cable TV network, broadband and IPTV in North India especially in the parts of Haryana. Digital marketing is gaining a lot of popularity in India. With each passing day, more and more people are using online medium to shop, sale and explore various products. One can’t imagine business without its presence on the web that’s why entrepreneurs are now promoting their businesses digitally to target more customers across the world. To connect with people effectively and promoting businesses, one needs to have a strong internet connection. Here the role of TriplePlay comes into action which provides unlimited internet at high speed at unbelievable prices. We use Fiber-to-the-Home (FTTH) system through GPON (Gigabit passive optical network) technology that allows us to deliver unmatched speed to the internet users round the clock. FTTH is an innovative technology that helps users to upload and download data or files 200 times faster as compared to other ordinary internet services. So when you really want to connect the world strongly in digital manner then broadband service of TriplePlay is the best thing for you.